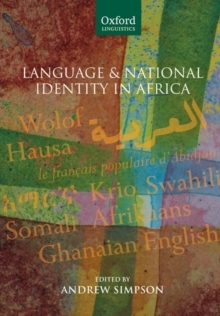 This book focuses on language, culture, and national identity in Africa. Leading specialists examine countries in every part of the continent - Egypt, Morocco, Sudan, Senegal, Mali, Sierra Leone, Ghana, Ivory Coast, Nigeria, Cameroon, Congo, Kenya, Tanzania, Zanbia, South Africa, and the nations of the Horn, Ethiopia, Eritrea, Djibouti, and Somalia. Each chapter describes and examines the country's linguistic and political history and the relation of its languages tonational, ethnic, and cultural identities, and assesses the relative status of majority and minority languages and the role of language in ethnic conflict. Of the book's authors, fifteen are from Africa and seven from Europe and the USA. Jargon-free, fully referenced, and illustrated with seventeen maps, this book will be of value to a wide range of readers in linguistics, politics, history, sociology, and anthropology. It will interest everyone wishing to understand the dynamic interactions between language and politics in Africa, in the past and now.